(1) CLAIM: After the existence of the "home brew" email server was revealed, Hillary turned over all work-related emails to the State Department from her private server, deleting only personal emails -- including missives about "yoga routines," "family vacations," and "planning Chelsea's wedding." REALITY: Records prove that among the 30,000-plus emails deleted by Hillary's team were notes regarding Benghazi and other Libya-related policies. Congressional investigators have no idea what else may have been unilaterally erased without independent supervision. What we know for certain is that some number of official emails were permanently deleted, not handed over to State, as claimed. (Bonus lie: Team Hillary initially claimed that emails were automatically flagged for deletion using a keyword search mechanism. They later changed their story, averring that they'd reviewed every individual email -- which means they necessarily eliminated emails they actively knew were not personal in nature). (2) CLAIM: Hillary set up a secret email server in her home as a means to simplify her life; she needed this arrangement to streamline all of her emails onto one mobile device. REALITY: Records prove that Hillary used multiple mobile devices to send and receive emails. This revelation caused her entire explanation to "crumble at her feet." Her initial excuse-making made little sense from the get-go. How is paying someone to set up an entire private email system a simplification? 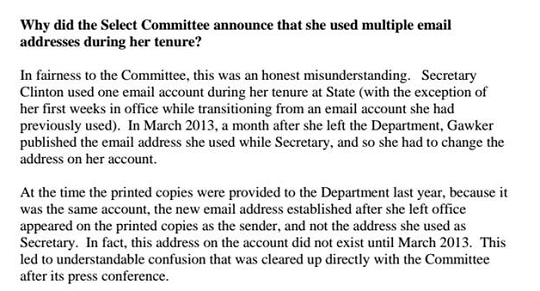 (Bonus lie: Clinton initially claimed that all of her work-related emails were intact because the aides with whom she corresponded uniformly used .gov accounts, the contents of which were archived. In fact, several top aides were revealed to have also used private email accounts to conduct official business, and the State Department was shown to have extremely shoddy archiving practices anyway. And that was all before the Sidney Blumenthal emails came to light, blowing up claim #1 above). (3) CLAIM: Clinton's lawyers stated that with the exception of a few days at the very beginning of the Obama administration, Hillary Clinton exclusively used one email address through her private server. (4) CLAIM: Top White House officials say they had no idea that Mrs. Clinton was operating a private email server and using it for officials tasks. Emails released Tuesday by the State Department show that former W.H. advisor David Axelrod knew Hillary Clinton had a private account despite recent claims. According to the latest batch, two email chains show Axelrod did indeed correspond with the then-secretary of state — once in June, 2009 and again in July, 2009. The emails contradict recent comments by Axelrod to MSNBC’s Joe Scarborough and Mika Brzezinski, in which he said he would have “asked a few questions” and shared his “concerns” had he known about Clinton’s private email account and server. Axelrod made the statements in a June 17 appearance after former White House chief of staff Bill Daley told “Meet The Press” that he didn’t know anything about Clinton’s private email during his time in the White House. (5) CLAIM: Hillary Clinton "fully complied" with " every rule" regarding official email correspondence and archiving. REALITY: No, she didn't. Not even close. (Bonus point: In light of the unprecedented and potentially disastrous OPM hack at the hands of the Chinese, it is clearer than ever that foreign intelligence services accessed Mrs. Clinton's emails with relative ease; her server was woefully under-secured, especially given the sensitivity of its contents. Hillary's response to credible allegations that she recklessly endangered national security for selfish political reasons is mind-blowingly silly. Either she's lying again, or she has no idea how the Internet works. Or both).